Rhythms of the Night is a spectacular and spellbinding event unlike any other. Puerto Vallarta is home a wide range of sights to see and activities to experience. There is the natural world: the brilliant Bay of Banderas, the scenic beaches, the tropical jungles nestled in and around Sierra Madre Mountains, and much, much more. There is the man-made world: extravagant resorts, delicious eateries, engaging tours, and an immersive culture. And there are remnants of a world gone by: ancient geology, ruins, and traditions still practiced by those locals who know them best. All of these characteristics make Puerto Vallarta a truly one-of-a-kind region, and all of them are featured in Rhythms of the Night: Puerto Vallarta’s #1 Dinner and Show. What is Rhythms of the Night? Rhythms of the Night is a spectacular and spellbinding event unlike any other. 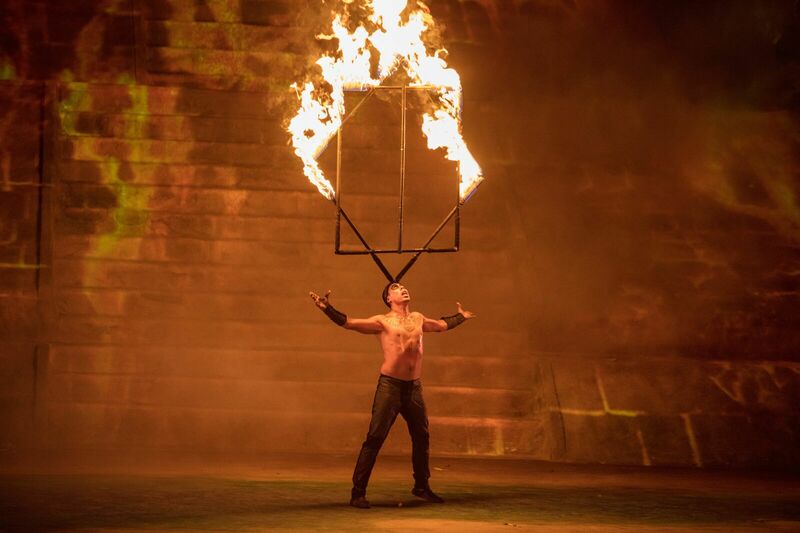 Created and produced by Gilles Ste Croix, the award-winning co-founder of Cirque de Soleil, Rhythms of the Night combines the region’s natural wonders with the awe-inspiring traditions of its ancient peoples in a show that is equal parts theater, ritual, and natural phenomenon. But Rhythms of the Night is also more than just a show. The event also treats its attendees to a sunset cruise across the Bay of Banderas, as well as a delicious dinner by candlelight. Explore the sections below to learn more about the many reasons why Rhythms of the Night is rated Puerto Vallarta’s #1 Dinner and Show by the New York Times and many local publications. From its outset, Rhythms of the Night was destined for greatness. That’s because this one-of-a-kind show was created by none other than Gilles Ste-Croix, innovative and esteemed co-founder of Cirque de Soleil: the largest theatrical producer in the world. Gilles Ste-Croix started Cirque de Soleil with founder Guy Laliberté in 1984. Since its inception, the company has gone on to produce numerous shows and earn several esteemed awards, including a Bambi Award in 1997, a Rose d'Or in 1989, three Drama Desk Awards in 1991, 1998 and 2013, three Gemini Awards, four Primetime Emmy Awards, and a star on the Hollywood Walk of Fame. Gilles Ste-Croix had an instrumental hand in creating The Beatles LOVE for show for Cirque de Soleil, as well as several other noteworthy shows. Since retiring from Cirque de Soleil in 2014, Gilles Ste-Croix has founded Circo de los Niños, a circus school in Mexico. Gills Ste-Croix created Rhythms of the Night to showcase the celebratory traditions of Puerto Vallarta’s ancient peoples and incorporate elements of the region’s natural environment. The result is an atmosphere that feels both authentic and breathtakingly visceral. This is accomplished in large part by the unique amphitheater in which Rhythms of the Night is performed. To witness Rhythms of the night, viewers must take a journey. Hidden deep within the tropical rainforest at Las Caletas, an iconic beach just south of Puerto Vallarta, lies an outdoor amphitheater unlike any other. The stage for Rhythms of the Night is hardly a stage at all — it is a timeworn pyramid nearly consumed by the jungle around it. Exposed to a starry sky, the pyramid and jungle coalesce to create a theatrical setting boasting unrivaled authenticity. Each night, the spirit world of the ancients comes to life alongside the natural world. Sit back and take it all in from your comfortable seats deep within the Vallarta jungle. Rhythms of the Night is now proud to present a brand-new show: The Legend of the Fifth Sun. Mayan legend has it that there existed four worlds prior to the creation of our own. These worlds each existed for a period of time; each traced the evolution of the human race, as well as its many demises. These previous worlds were destroyed by tornadoes, fires, and floods — yet rituals and sacrifices have kept the human spirit alive. From the ashes of the ancients comes a celebration of a new sun, the Fifth Sun, and hope for a better world. Powerful images, original music, dance and acrobatic performances envelope the outdoor amphitheater in this magical display. Let your imagination soar back through ancient times and up to the present day with Savia: The Legend of the Fifth Sun, the newest show at Rhythms of the Night. On top of the award-winning show, Rhythms of the Night offers attendees a scenic sunset cruise and delicious candlelight dinner to complete the evening. Festivities begin with the cruise, which starts at Puerto Vallarta and crosses the Bay of Banderas at sunset to reach a secluded at Las Caletas, former hideaway of famous film director John Huston and entryway to the jungle amphitheater where Rhythms of the Night takes place. Before going to the amphitheater, guests are treated to a gourmet candlelight dinner on the beach. Delectable offerings, fine wine, and an open bar await you and your party at Las Caletas. Enjoy an excellent meal and swing slowly in a hammock as the ocean laps gently on the shore. What’s the best way to enjoy Rhythms of the Night? As a VIP, of course. Here at Vallarta Adventures, we are proud to offer a Rhythms of the Night VIP package to treat guests to an evening unlike any other. In our Rhythms of the Night VIP package, VIP guests are given preferred boarding seating on the sunset cruise, priority entrance for the show, and exclusive seating and dining locations. To learn more about the many benefits of our Rhythms of the Night VIP package here at Vallarta Adventures, click here. Read More About Rhythms of the Night and Book Today! Want to learn more about Rhythms of the Night and our latest show, The Legend of the Fifth Sun? 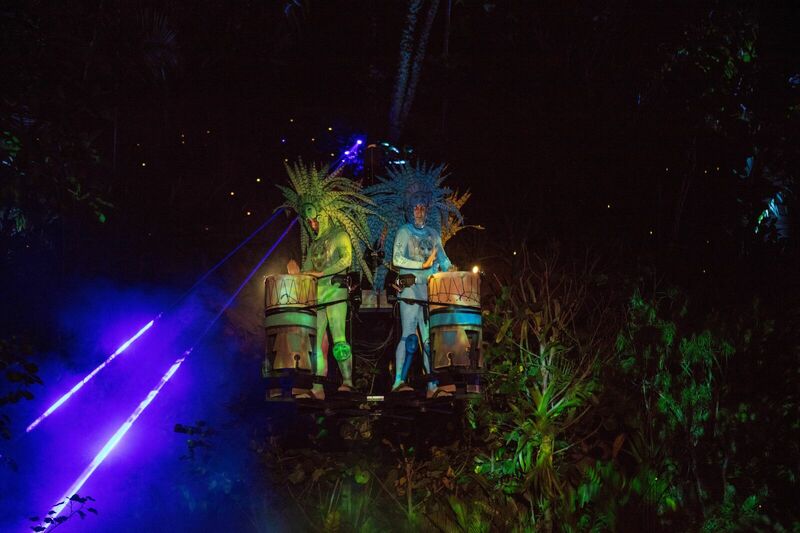 Visit our Rhythms of the Night page for additional resources and FAQs, and contact our team here at Vallarta Adventures to book your tickets today!